The Klassenfahrt project expressed a collective intention to experiment with the model of the “educational trip” as an integral part and mechanism of contemporary artistic experience. It was initiated by the Austrian-based Memphis, project and exhibition space of the culture initiative nomadenetappe – Kunst & Theorie and it was organised by Nikos Arvanitis, Jakob Dietrich and Kai Maier-Rothe. Through the publicity offered by the Athens biennial, Klassenfahrt was advertized as a unique educational/artistic experience designed by the famous BlueOwlTravels agency. Curious artists and art goers applied online at BlueOwlTravels.com to book a seat on the Klassenfahrt bus. Though the webpage did not include any info regarding the content of the tour or the actual destinations, the bus was soon fully booked for the entire duration of the project. International visitors were picked up from Omonoia Square, downtown Athens, the bus tour’s departure location. An experienced architect/urbanist was appointed as their tour guide and led the group to each location of interest. The three hours bus tour included sightseeing through typical and non-touristic neighborhoods of Athens and its suburbs, a quick meal and three unexpected destinations. First stop was at a small green hill close to the city center where the participants visited an open air amphitheatre unexpectedly showing up through the hill’s vegetation. The guide asked the participants to occupy the stands and told them distorted stories about the role of theatre in the social life of Ancient Greece, mimicking the fetishization of Ancient Greece through Documenta14’s restless referencing of classical Greek antiquity. A strange passerby sprayed the stencil of an owl on the amphitheatre’s ground, which was actually designed as a big-scale chess-field. Next destination was an abandoned villa at the Northern suburbs of Athens. This derelict sight used to be the setting for the shooting of many Greek movies during the ’60s. In those past times, this luxurious villa, and the garden around its pool, used to function as the spectacle of a dynamic modern bourgeoisie admired by the emerging middle class. In recent decades, the building would be abandoned and looted. The architect/urbanist narrated the story of the villa and spiced up the actual events with rumors of “sexual scandals” and “mysterious rituals”. The visitors would notice the strange presence of a guy pointlessly cleaning the empty -now fool of dirt and debris- swimming pool. Some would notice the owl tattoo on his left arm. The final destination was the most unexpected one. The bus reached a rural area, with some agricultural structures, small family industries and houses – a kind of no man’s land. The bus suddenly stopped. The narrow street was blocked by a dark figure sitting on a sofa. A Mexican Satanist, an Indian, a pink gorilla and two kids blowing a musical organ entered the bus and made irritating noise. The bus driver and the guide explained that the bus cannot proceed further. The group debarked and followed the strangers. Walking through a rural area, they soon reached an open field hosting a small village. The tents were inhabited by this strange community of excited locals. 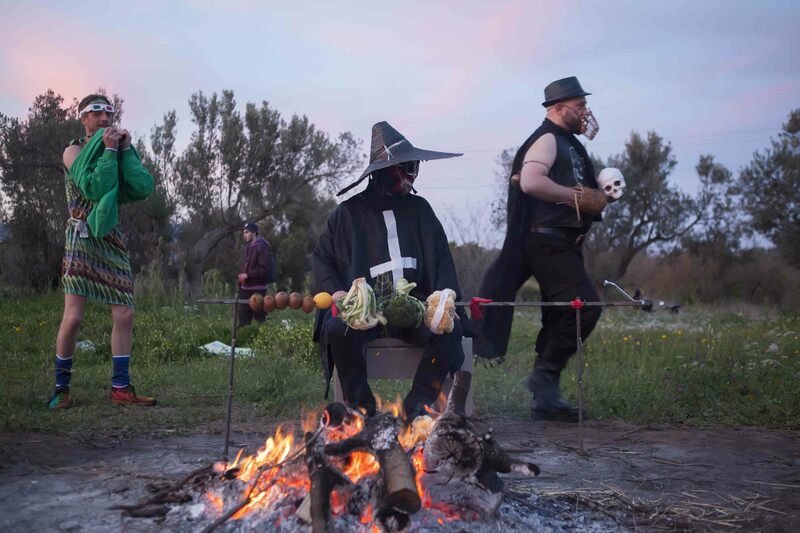 The Mexican Satanist and the Indian were roasting vegetables. A teacher was delivering drawing lessons. An ominous dark figure holding a skull came out of its tent and prepared to attack. A tennis coach delivered loud orders. The female “head of the tribe” welcomed the visitors and asked them to sit around her. She started saying stories about a community of autochthonous people that used to inhabit various locations in Attica. According to the story, the people on the field are the progeny of and the indigenous athenian community of the Atticani. According to her story, the Atticani decided to abandon their land in the center of Athens, in early 20th century, when Athens started being urbanized and industrialized. They realized their own exodus towards the rural suburbs in order to “maintain their traditional lifestyle and values.” Two blind twins were singing local songs and presented photos of their ancestors and their original land’s. The unexpected encounter with such an absurd and grotesque “indigeneity” was employed as a mimetic response and critique to Documenta14’s thirst for “indigenous resistance”, “indigenous knowledge” – central features of the “anti-neoliberal front of the Global South” as proposed by Documenta14’s theorists. This strategic mimicry was meant to function as a challenge to the exoticising and orientalist fantasies in contemporary art and the global art field – a way to critically deal with art’s institutional tendency to “localize” itself by discovering localities that supposedly reflect the quintessence of universal injustice, struggle and resistance. These stereotypical depictions of “the indigenous” as ominous yet wise and pure “magicians of the earth” evoked the process through which art and curating often fetishize local identities as inherently resistant, anticapitalist, authentic and free. Visitors and participating artists had a chance to playfully experiment with their own pre- and mis-conceptions, beliefs and fantasies. This play of expectations challenged the perception of locality and periphery as land inhabited by “noble savages” or resource for “alternative knowledge and lifestyle”. Klassenfahrt was a collaboration between the artists Nikos Arvanitis, Alexios Dallas, Jakob Dietrich, Kyriaki Goni, Dejan Kaludjerović, Vana Kostayola, Kai Maier-Rothe, Panos Sklavenitis, Kostis Stafilakis and Axel Stockburger, the theater director Christine Eder and the political economist and cultural scientist Anamarija Batista. Klassenfahrt is a project initiated by the Austrian-based art space Memphis and is funded by the Arts and Culture Division of the Federal Chancellery of Austria, the cultural department of the government of Upper Austria, the city of Linz and the Austrian Embassy in Athens. Klassenfahrt is realised in collaboration with the Athens Biennale. The project was realised due to the participation of the performers: Kassiani Goulakou, Lefteris Hatzikostantis, Thodoris Kakitsos, Katerina Kalentzi, Kostantina Linardatou, Anna Linardatou, Nikos Manolis, Athina Mpozika, Tasos Papatsoris, Simos Prasinos, Panagiotis Skalkotos, Marios Pavlou and Margarita Pittara.